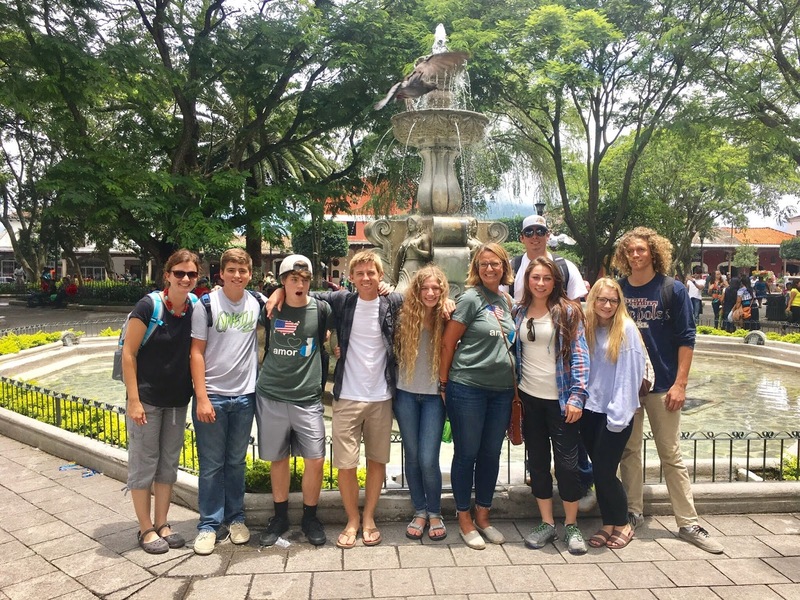 CVC students on a mission trip following His call and serving in a rural Guatemalan community for Him! Aren't we supposed to be there already? Yes. We are. God intervened to keep us safe from the aftermath of the volcano eruption in Antigua Guatemala that occurred just two hours before we were scheduled to leave for the airport. We never even got to leave. Mass confusion those first 24 hours turned into a frantic searching for more news on volcano eruption on the tv or on the internet. Quickly doubts and fears surfaced among both students and parents as we were delayed to leave by 4 days. Our flight was scheduled for Wednesday evening, the night flight arriving there Thursday morning. Yes, it is lost time on the outreach. We will miss some important orientation and rest time. But we are here, and we are safe. Our little world seems so small compared to the horrific things occurring in Guatemala. Magdalena is not in danger of any fallen ash, or bad air quality. The destruction, loss of life an evacuations have all occurred in 4 areas at the foot of the Volcano Fuego. It really is a mess and the recovery efforts may take quite some time. It is my prayer that God will allow the missionaries and the staff to check on their families an extended families before the teams arrive on Thursday. Host families are anxious to see us, feeling guilt for not having students now to welcome into their home-they are THAT inviting and warm. Students arranged a prayer gathering for the team and for Lizzy Highstreet. I was proud of the students and how they took charge of the situation and comforted one another. It was a great meeting and was an important one to inform each other and pray. Thrilled to see this happening! Later this afternoon, my coleader Kristin Pinter and I met with a few parents to calm nerves and answer questions that they had regarding the trip and safety. That was a little more difficult but I was encouraged by parents and their trust in the system, in the links in the chain putting this all together. We are all anxious and ready to arrive, and know that god will do great things in our team and in this trip, even if it is a late start in arriving there. So, tomorrow we leave-so ready to get there! Guatemala..the sound of it makes me nostalgic. Thinking of the streets we walked on, the sounds we hear, and the families that have become like my own. Hard to believe that now we are leaving in just 5 days to be there for two weeks. Our group of 13 will be joining with a team from Louisianna and Southern California I believe. Every year I go I bring new faces with me to introduce a new culture, there's the excitement. One underlying theme is that we are there to show Jesus and what ends up happening each year is that Jesus is shown to us. Words cannot describe how influential these people have been on my life and on the kids that I bring. Guatemala is just..special. It is definitely a second home to me. These are the walks to remember..the path that leads to El Gorrion. Months of preparation have gone by. Meetings, sandwich preparation, bracelet fundraisers, enchilada fundraisers, tshirt design and sales, purchasing flights, arranging into ministry sites and even host families, sorted out donations for the ministry sites and will pack very soon. I and my students are ready for the adventure and to serve...in another country. Feelings of missing the tiny things in Guatemala, like having to drink water from the jug, not being able to shower with hot water every day, not flushing toilet paper in the toilet, having quiet time set aside each morning, riding in the back of a pickup with tarp covering us for rain, and even not using a cell phone for everything are some of the things I miss. I'm not gonna lie, when I first got home, a few of those things were so refreshing and awesome-but I miss them now. What an experience we had the last two weeks in Magdalena! I saw kids using Spanish with their host families, hugging Guatemalans in tears, sewing or making jewelry with those same women in COMMUNITY with them, helping lead worship, encouraging their teammates when they may have needed it most, sharing their hearts during team times at night, giving of themselves to help Guatemalans whether at their work are or host family, genuinely caring for niños en Guatemala, playing soccer with kids on their shoulders, visiting Guatemalans in their homes and praying with them, and worshipping with 2 other teams from Louisianna and Fresno and playing UNO with them! I am SO proud of ALL the kids on my team for the things mentioned above as well as the love they showed to each other! Parents you should have seen how much they valued one another by their smiles and support, even on the days they weren't feeling the best! Once again, I feel privileged and blessed to have been their leader. God is smiling down on this team right now, enjoying family! I already miss you! So many stories flood my mind as I reflect on the last few days that we have been back at worksites. Our weekend was a great time of anticipating what was to come. Your kids have shared some deep felt stories and testimonies of their time here. They have shared a love and appreciation for their host families- they not only provide food and nourishment, but really care for them, their health, and their lives! Magdalena is so special! Did you know that when we have team time at night- it usually ends at around 8:15 or 8:30 and it is already dark? The host dads from each home wait for us outside of our meeting place to make sure we get home safely- like our personal bodyguards? The host dads form 3 different groups that are in charge of waiting for us to walk out and they bring us home for the short walk. Wow! The devotion that they have to us and the love they invest in us is incomprehensible. Relationship eps are being formed even is there is language barrier. God is good and is being revealed here. I want to thank you parents, for allowing me to take your kids here- to experience this place that I love so much. I had a visit with TJ price and Brian Fabrie at their host home yesterday. Their host mom, Iris, shared her testimony and they asked if I could come and translate for them. She is an amazing woman with an amazing testimony about how God saved her from a life threatening brain cancer that was sure to end in death for her at the age of 15. Her testimony was that God was the ultimate healer ad that although the doctors said that she wouldn't ever have children because of the string medication eps ape was on, she had 2 kids. She quit taking her medication, prayed and fasted for a month and a half believing that God would cure her. Her next cat scan revealed that her cancer had disappeared! She truly is a woman of God, and I am thankful to call her a dear friend. She truly cares for and takes seriously her role as host Mom, follows the dietary guidelines set out by Students International, and her husband, Ezeqiel, is so hard working and caring as well. What a blessing it was to be there yesterday afternoon! We are now in our morning quiet time, and have been studying the book of Daniel and how he was honored by God and lived by His word. He prayed diligently and Gospd showed his favor on Him, not only in the lions den, but in his life. What an awesome start to each day we have had! Blessings to you at home! New week, great team, and lots of fun! Hello parents! We are all doing well. I hope that you have been able to see pictures on both Facebook and the SI Guatemala page! I have been blessed by your kids, and their willing hearts to serve. We went zip-lining on Saturday, and the kids tested their fear of heights and saw the beautiful scenery provided at the hill overlooking Antigua. The ropes course was called Circo del Aire, with 13 different stops along the way. The last distance was the longest, and the students had the option of going traditional zip line position, or "Superman" style, as if they were laying on their stomach with their arms extended out. There were a few of those, the daring ones. I can't talk, I didn't even do the zip line, haha. It looked like fun, just climbing that ladder gave me the chills as I watched all my students climb it! Yikes! After the kids all enjoyed themselves on the 2 hour or so zip line, we ate lunch in San Lucas, on our way back to Magdalena. We ate at McDonalds! Here McDonalds is quite nice, in difference to the states. After that, we returned to Magdalena. We had a few hours of free time, and then ate dinner in the Community Center. On Sunday, we attended church at Pastor Mario's. Church here is long. We heard the Sunday school kids come up to sing, and share. We three leaders gave a welcome from our home church or school, and our 3 teams went forward to sing 2 songs to them. We sang Abre mis ojos, oh Cristo, and 10,000 reasons. After that, we heard a sermon by Pastor Mario as he spoke on the book of Daniel. Sra. B translated. After lunch, we all went to Antigua for the afternoon, and ate lunch at Pollo Campero, a KFC - like chicken place here. Afterwards, we all went to the market and bought a free things. :). We ate dinner at Luna de Miel and Fernando and Marianela joined us! They both look great! We are ready for a new week at ministry sites and look forward to how a God is moving the team! Prayers are appreciated for us all here! End of the first week today- Friday! Thirsting for water and food, runny noses, and dirty smiles, I addition to inviting each of us, at different times into their home with dirt floors. People in the Él Gorrion area are so proud to share of themselves, and delight in our presence. presence. Being there for the people, that is what we are learning, to lay aside the conditions, the smells, the sights for Him. From that comes a joy unexplainable. My goal is to become more like that. To lay aside the material things of this life to be "present" for what God has for me. Hearts on the team are being broken for things they have never seen before, for what hurts Gods heart. As I sit this morning and hear their voices of all 3 teams here, my heart is overflowing with joy that my students are HERE! And healthy! God has been good. I am so thankful for the many blessings of seeing your kids actively playing soccer with the kids, of entering the homes of those in need, of carrying small snotty faced children, and extending love here. How I wish that you could see your kids, and see the smiles on their faces. Yesterday a student said to me, "oh, Sra. b, I'm DEFINITELY coming again next year", three boys at the end of each day, giving hugs and thank yous to me for allowing them to be on the trip. I see and hear great things from each site and today the women's social work site and a few others are going to El Tablon, an impoverished area where they hope to hold a triage medical clinic, hold a women's Bible Study and sell some of the items made by the women in El Gorrion as well as share with them how to make them as well. I am so thankful for our adults on the team, Michael Kornelis, Ally Kornelis, Pam Moore, and Lisa Colburn helping in different areas...leading worship, taking pictures, updating the blog when I can't because of no Wifi or whatever. All of us are at separate sites, so we different things each day. Wow! What a great experience it have been so far! Our day began with worship and prayer, as each day here will be. We sat in quiet time studying the book of Daniel and reading and rereading. Our first team time the other night I encouraged the kids to apply this trip to their lives, to soak it all in, and journal their thoughts. The kids were given around 35 questions to journal throughout their stay here, and that night we shared our questions and answers. I asked for 6 kids to share, and we doubled that! What a great start to the trip- the students are already open to sharing with each other- tiny steps that will lead to bigger and better things, I can already feel it. Wednesday night we have team time again and the kids are going to be asked to share their testimonies. Team time is in the evenings is just our team, not the other ones joining us- we meet all together in the morning for devotions and quiet time. Yesterday afternoon we had ministry site orientation and met with the ministry sites that we were assigned. I was able to see kids in prayer with their site teams and physically we walked to where we would be working! The Women's social work site, the group I am in with Charlize Guess and Pam Moore, was humbling. They have a new location in El Gorrion, and do sewing and jewelry making with the women. Women are ministered to through Bible study once or twice a week. We plan to have a prayer walk with the women as well as. Is it another community, El Tablon, this Friday. The women have small children that come to the site and we are able to read and play with them while their mom works, in addition to connecting with the women. Sheny is the new leader of this site and I am excited to see what is going to happen this not wek and a half! Sites begin tomorrow. You will be hearing about a ministry site spotlight over the next few days! We went to the Community center last night for dinner that was prepared for us and we targeted poverty and how it must feel for those eating rice and beans, every day, sometimes for multiple meals a day. We viewed a movie on poverty as it is experienced here in Guatemala and how there are multiple layers of poverty, economic, bodily/hygiene, societal, political, spiritual, and educational. Each type of poverty affects another in some cases, and when it is experienced early in life, can lead to a drastic cycle that never ends. When asked "who are the poor?" We all thought about that question and answers were given like "a lack of basic needs materially, educationally, monetarily, a supportive community/family, etc..." Students International attempts to address this issues and transform the community By working alongside them where they are and providing support. Will you pray for us as we face this challenge? Hearts are being broken and students are already drawing nearer to Him through this experience. One of my boys said to me tonight at dinner, "My host family is great, this experience has already been amazing!" And we haven't even begun worksites yet! As I reflect on seeing faces that I saw just after one of the most difficult times of my life last year, I see how Gods hand is in it all, already! Will you join me as I thank Him for this wonderful group of kids I have here and for His hand of guidance over the years?" I am in awe- thank you parents for "loaning me" your kids for these 2 weeks! We are blessed! We will serve You Lord..in Guatemala!